We bought this set for our grandson's room. The details and quality are just as great as displayed in the picture. We probably won't use the quilt in his crib, so it would be a nice to have the option to buy without and still be offered a set. Great colors! 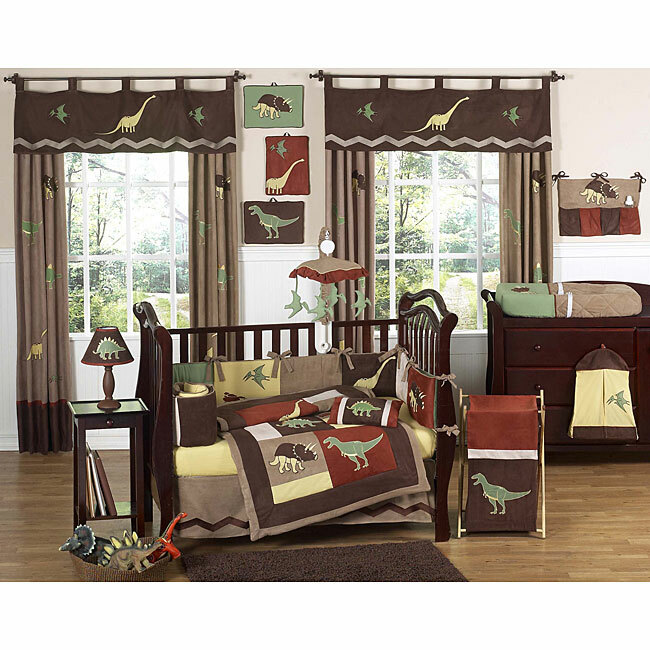 This dinosaur themed nine-piece baby bedding set was created by Sweet Jojo Designs. This set includes a blanket, crib bumper, crib skirt, fitted sheet, toy bag, decorative throw pillow, diaper stacker, and two window valances. Was concerned about all the brown with a black crib, but it acutally looks very nice. Chose it because it's not the standard boy bedding theme and we love it. Didn't use the quilt in the crib but as a wall hanging - good alternate purpose. I let my son and daughter in law pick which bedding for their soon to be here baby boy and they chose the the dinosaur theme. They were very pleased with how it looked and the quality. The set also included a hanging musical box that attaches to bed with little dinosaurs that spin around with the music for the baby to enjoy. This was not mentioned in description, so it was a suprise!! They sent a picture after setting everything up and it looks great! 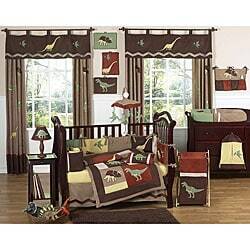 This dinosaur crib set is every bit as beautiful in person as pictured. The quality of the fabric is excellent and super soft. The colors are handsome and rich. I look forward to adding to the collection with the accessories available. I loved it so much, I purchased the twin set for him to grow into just in case this pattern is discontinued. We ordered this bedding for our son's nursery. Very nice fabric and excellent quality. My only complaint is that in the picture the red looks like a brick red. But when it arrived it has more of a burnt orange/ red color. Looks great but can be a little deceiving. Overall love the product! This set is adorable! I wanted something different for my 2nd son's arrival, and since my first son LOVES dinosaurs this was the perfect set. The material is VERY soft, which is good for the bedding; however, the valance has the same softness so it's a little floppy and sags. That is why I only gave it 4 stars. Overall, you will not regret this purchase! "does it come with the lamp , diaper pad on the diaper changing table not the table, pic.. on wall and the spinning dinosaurs above the crib"
"how do i get the other items that go with the set"